Up and coming stayer, The Fire Inside (pictured), is shaping up in great order ahead of her next assignment at Ellerslie in the Rating 75 event over 1600m on Saturday. Following a short break and a freshen up, The Fire Inside resumed at Ellerslie earlier in the month and produced an electric turn of foot to finish in third place in the hands of Opie Bosson. “Her last start performance was very encouraging, and if she can take a handier position this time round you would think she is one of the main chances,” co-trainer Chad Ormsby said. The Fire Inside will be ridden by jockey Michael McNab this weekend and has drawn the ace barrier (1). The second and final runner for Ballymore is Thats How We Roll who lines up in the Rating 65 event over 2200m and jockey Michael McNab has again been appointed for the ride. 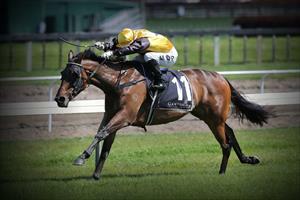 “He’s got a few tricks this horse and he hasn’t had things go his way when needed,” Ormsby said.